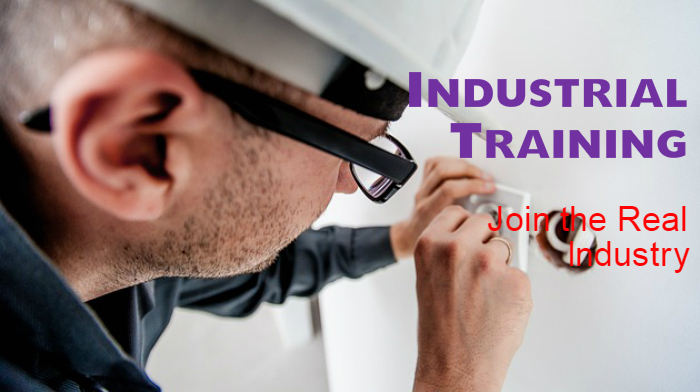 Industrial Training is a very familiar word for engineering students. When we are talking about a various stream of engineering study, the practical knowledge or live industry related experience boost up the chance of better job placement. During the College study in any branch conduct the soft skill grooming. The first is the theoretical systems; conducted primarily in the form of lectures, tutorials and laboratory experiment. The second session is the practical session, in the form of Research and Industrial Training, during which the students apply theories learned. Now a day many well reputed educational institutes provide an Industrial Training to their students. Training/apprenticeship is provided students for enhancing their knowledge whatever they learn by classroom teaching. It gives facility to expose their knowledge in the practical world. Give chance to know actually industrial environment before awarded their desired degree. Its duration depends upon the course. It varies according to Branch and level of their qualification means Bachelor or Master Degree, Diploma or vocational course. Normally the industrial training period will be 1 to 6 month. It offers during the final year of graduation. Duration depends upon the institute course curriculum. normally around 4 to 6 months offer. It’s best opportunity to secure a job before the final degree award. During training period students have a chance to select an employer. Training Provider Company has also benefit to get trained candidate from a college campus. So they no need to advertise about that. Some Limited company or semi-Government Company provide monthly basis stipend to a trainee. The ultimate goal or reason for the industrial training is to accelerate integration into professional careers. when a college graduate is hired for doing a certain task, he has enough practical knowledge of that task.